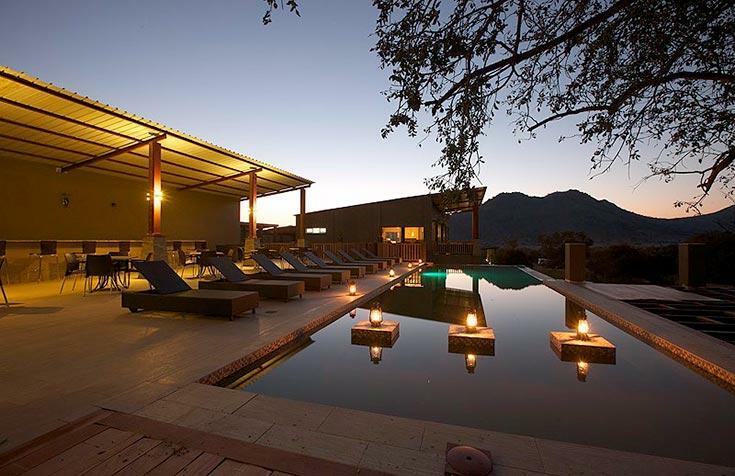 Shepherd’s Tree Game Lodge is set within an exclusive-use zone in the south-western corner of the Pilanesberg Game Reserve, world-renowned for its Big 5 game viewing. 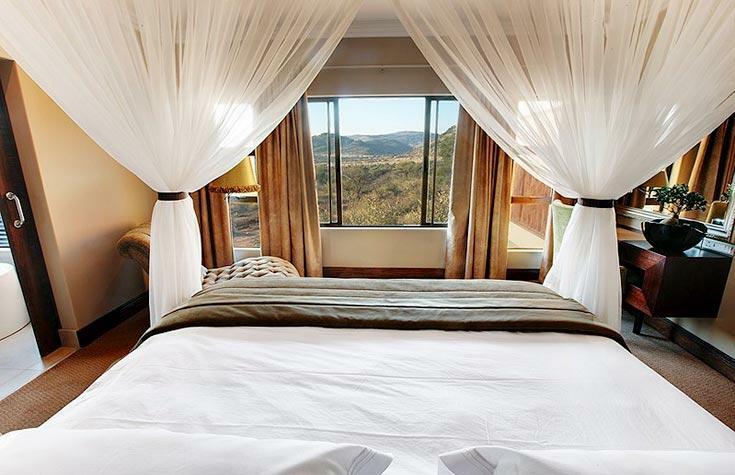 This sumptuous Lodge is designed to offer visitors a secluded base from which to experience the best of the Pilanesberg bushveld without compromising on comfort or amenities. The Lodge’s contemporary style, clean lines, flawless finishes and earthy tones are reflective of the naturally pristine landscape. 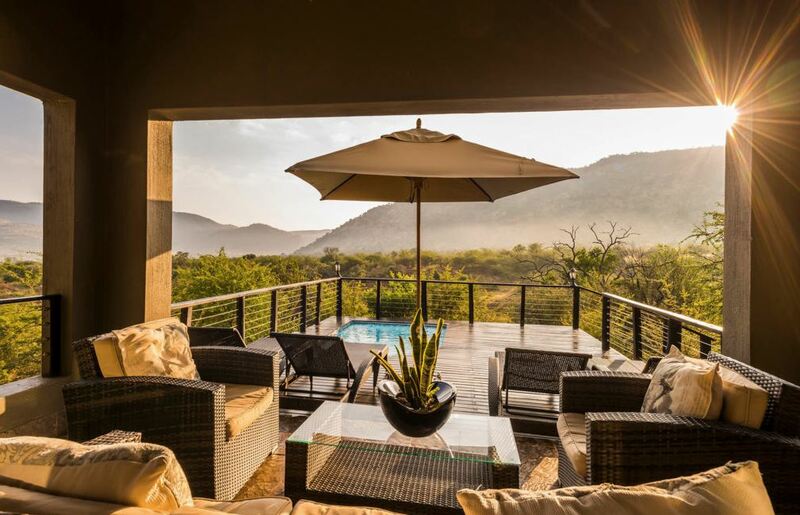 Shepherd’s Tree Game Lodge provides three accommodation options: private villas, complete with plunge pool, and executive and standards suites. 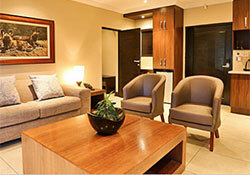 All suites feature a flat screen TV with select DSTV channels, private deck, and outdoor shower/s. 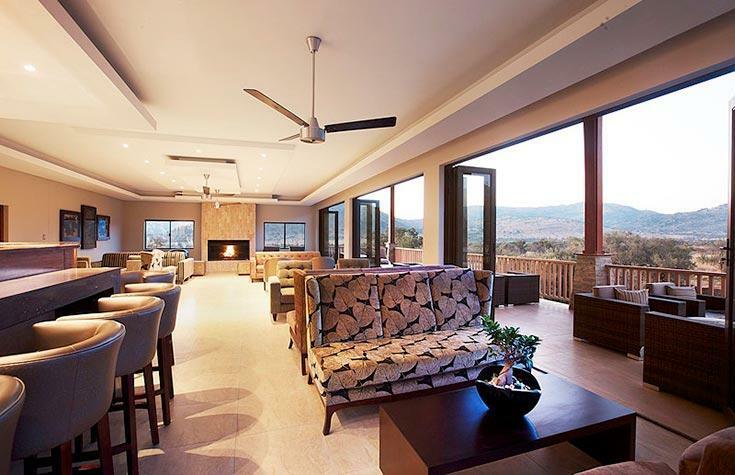 Whether you’re relaxing on your private deck, savouring a five-star meal in the dining area or cooling off poolside, you’re never without a spectacular view of the plains below. 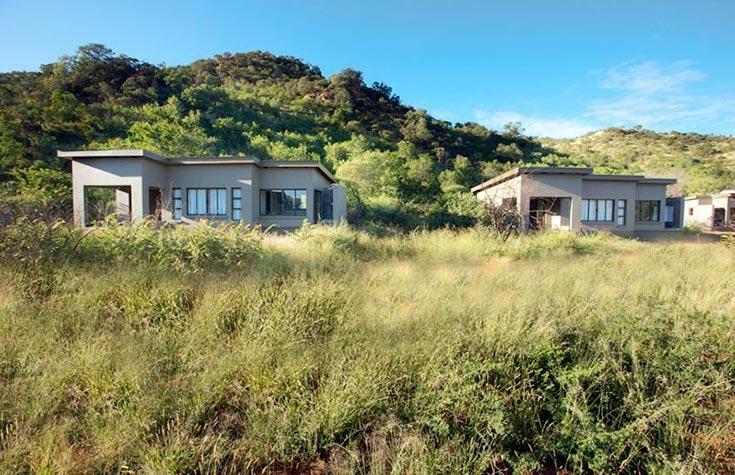 Plus, its prime position adjacent to the Pilanesberg Wilderness Area makes Shepherd’s Tree Game Lodge the ideal base from which to enjoy the area’s adventurous walking trails and get up close and personal with the resident bird- and wildlife. Shepherd’s Tree Game Lodge is a lodge concession awarded by the North West Parks & Tourism Board, custodians of the land. 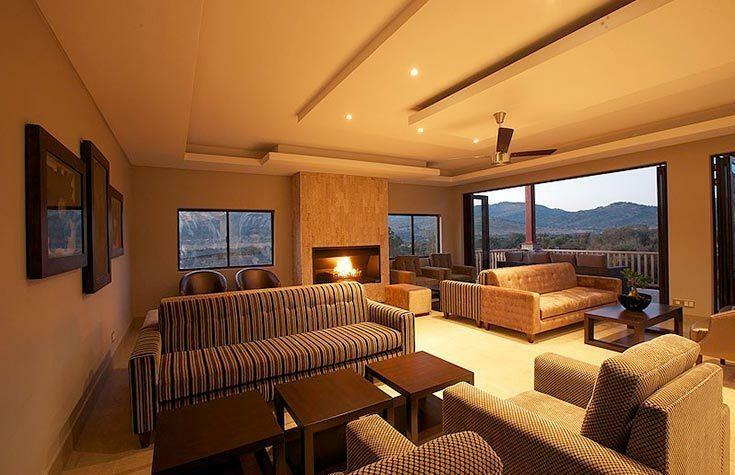 Acquiring a share in Shepherd’s Tree Game Lodge entitles you to the exclusive use of the Lodge’s facilities for a period of 40 years, as well as access to all the Pilanesberg National Park’s public roads. Children between the ages 6 – 12 years will pay 50% of the adult sharing rate. Children over 12 are charged as adults. Situated in an exclusive-use area, aha Shepherd’s Tree Game Lodge offers a variety of activities that go well beyond conventional game drives! 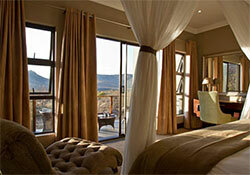 Get the latest information about Pilanesberg activities and the award-winning Amani Spa at our reception. Experience the African culture under a starlit sky with a percussion band and interactive drumming circles, ensuring a joyous night around the campfire. Join us for informative talks by knowledgeable game rangers to better understand the Pilanesberg environment and African naturescape. 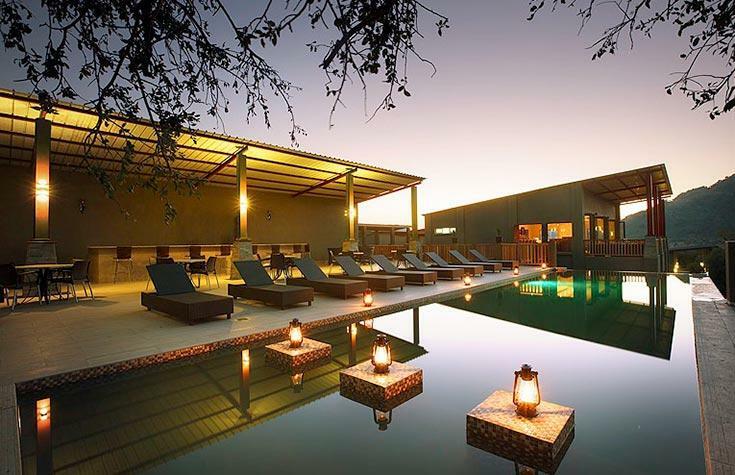 Relax in the lap of luxury at the award-winning* Amani Spa, offering three spacious private treatment rooms that command an impressive vista of the expansive bushveld amphitheatre. You can enjoy holistic rejuvenating spa rituals, luxurious massages, pampering facials and other beauty treatments. For an intimate retreat, try the couple’s suite with its hydro bath! *Awarded the Safari Spa Award at the prestigious Les Nouvelles Esthetiques in 2007 and 2013. 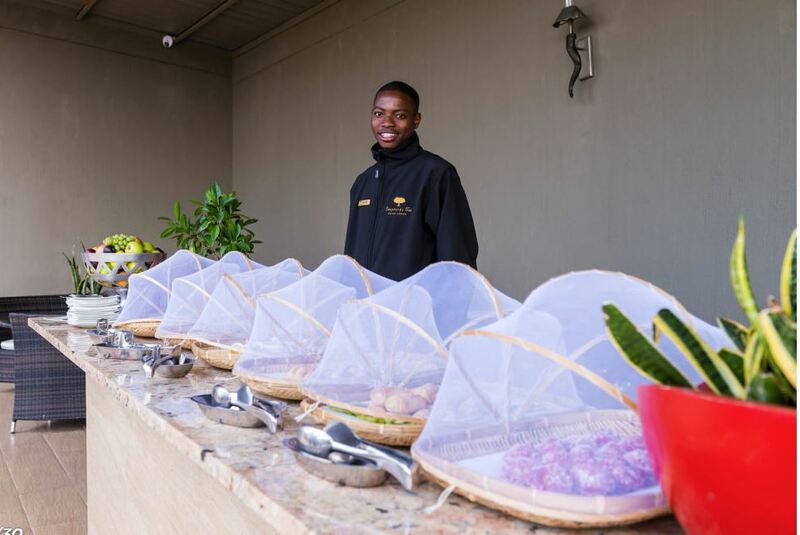 Guests at aha Shepherd’s Tree Game Lodge are invited to enjoy delectable cuisine in our gourmet restaurant or outside at the boma in a bushveld setting a mere 2.5 hours’ drive from Johannesburg. 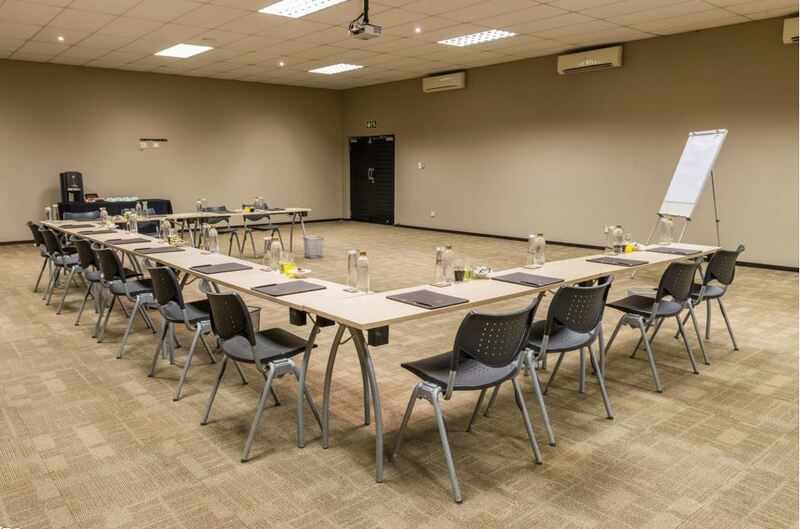 Shepherd’s Tree Game Lodge’s facilities and services ensure leisure and convenience for our adventure-seeking guests. After a busy day spent outdoors, you can get the relaxation you deserve at the award-winning Amani Spa, which offers holistic body, skin, and beauty rituals. Get a soothing massage while enjoying the view of the lodge’s bushveld amphitheatre. 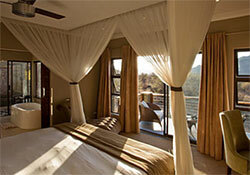 Shepherd’s Tree Game Lodge is located in the North West province, approximately 2.5 hours drive from Johannesburg. 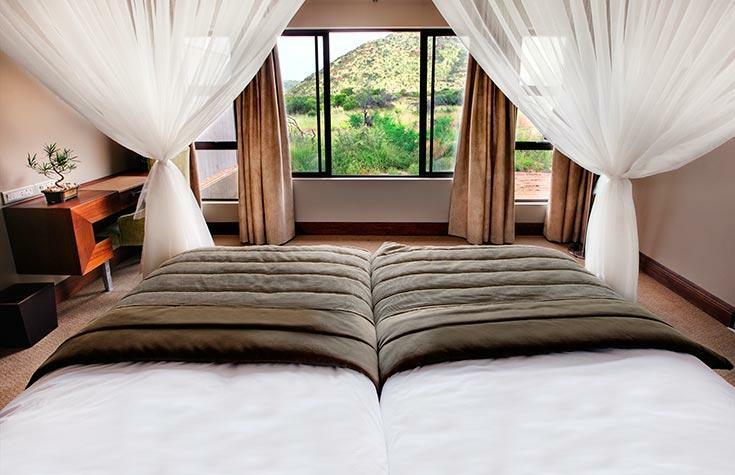 Situated in a private concession within the Pilanesberg National Park, our malaria-free property is host to a wide variety of mammals and bird species found in the Big 5. 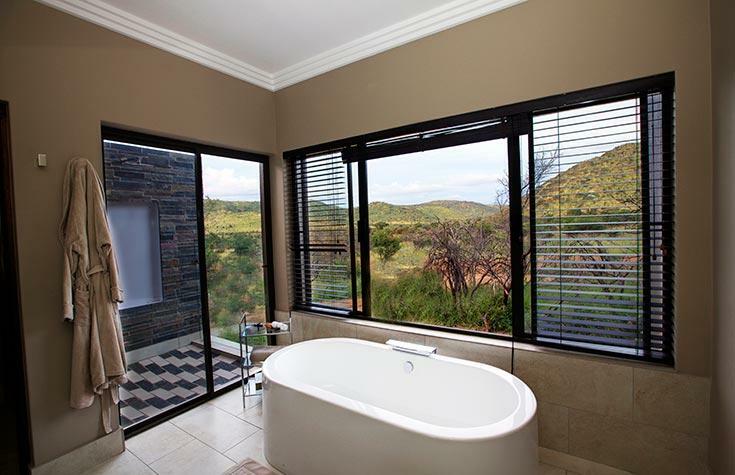 The Standard room features an en-suite bathroom with a patio overlooking the magnificent Pilanesberg GameReserve. The Standard rooms, which comprise a main bedroom with outdoor shower, can be combined to create a family room option, which in turn comprises twosleeper couches, a covered patio as well as a flat screen television with limited DSTV channels. 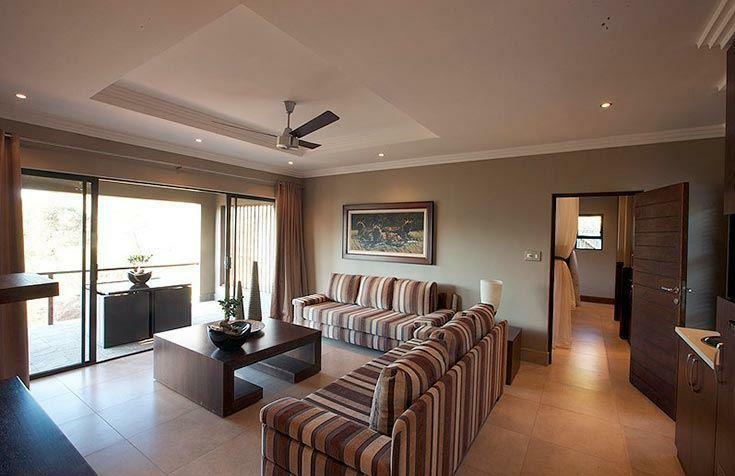 Please note that there is no television in a standard room and is only available when booking a family unit. 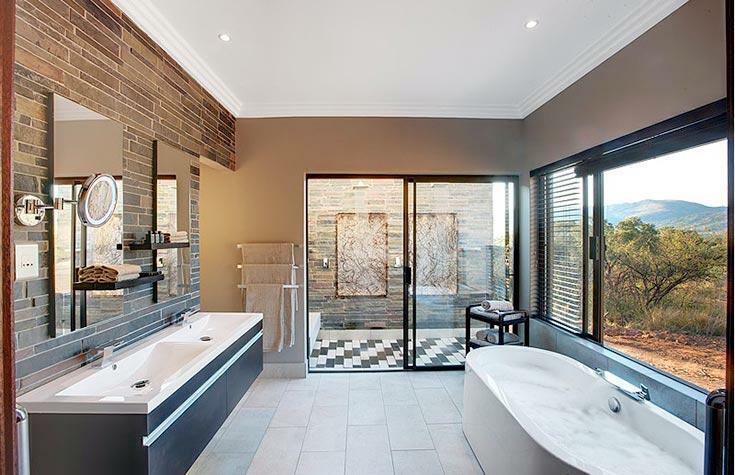 The Private Villa offers breathtaking panoramic views of the Pilanesberg Game Reserve comprising two rooms each with en-suite bathroom as well as an outdoor shower. Between the two rooms is a spacious lounge with a flat screen television leading out onto a patio with its very own private plunge pool for those wanting to relax under the African sky. 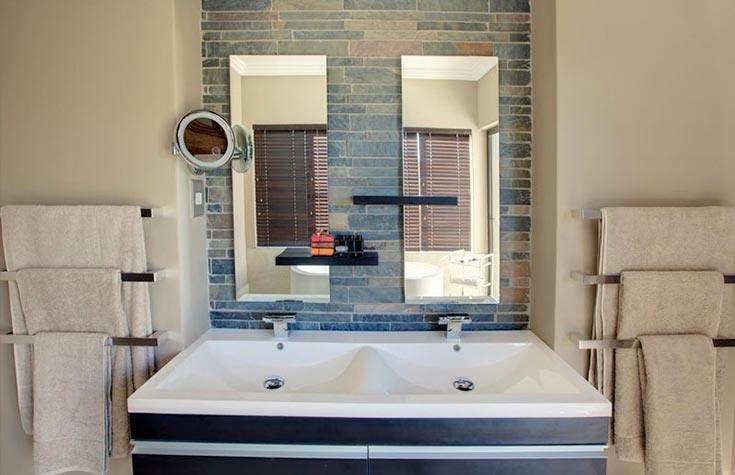 The Executive Suites offer an en-suite master bedroom with an en-suite indoor steam shower and double outdoor shower. 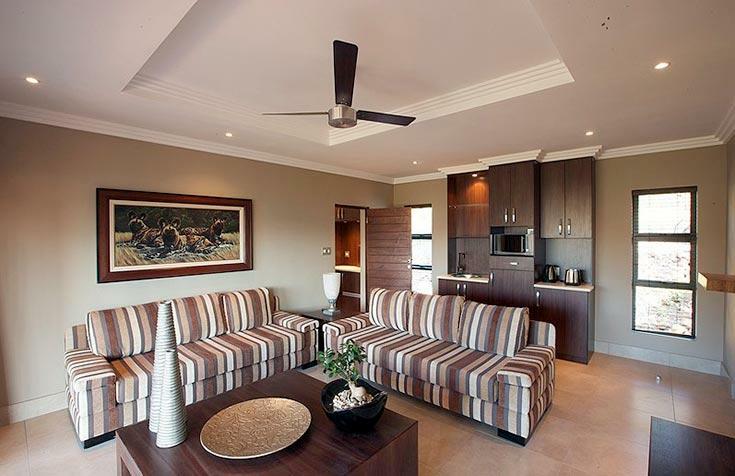 The units each have a lounge which has a flat screen television with selected DSTV channels. 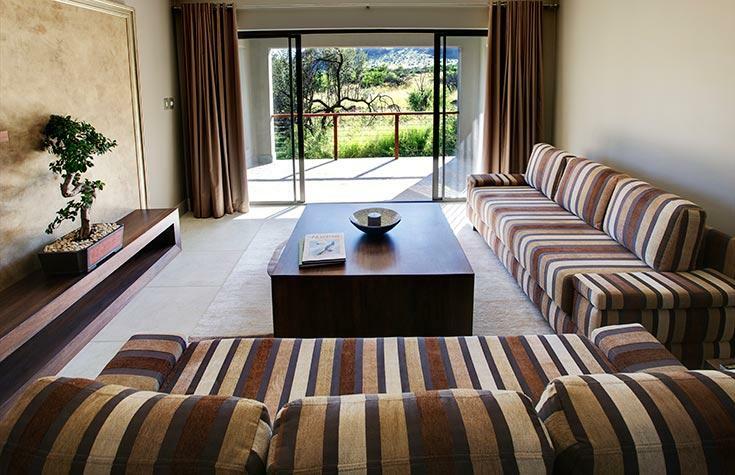 The lounge leads out onto a patio that overlooks the Pilanesberg Game Reserve.